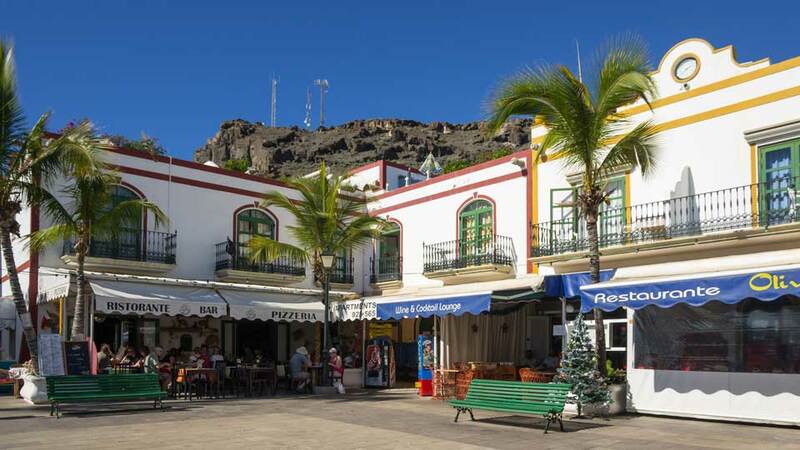 With the most breathtaking beaches and harbors on the island, an array of imposing valleys, towering mountains, and picturesque cliffs that greet the Atlantic, the majestic Mogan is undoubtedly one of the best towns to visit in the whole of Canaries. There is simply so much to see and experience, plenty of riches to discover and explore, and countless unforgettable memories to bring back from the southwest of the beautiful Gran Canaria. This fascinating town boasts many of the top tourist spots on the island and offers entertaining activities for everyone. Nature explorers are helplessly enamored by the spectacular landscape and abundant flora and fauna of the countryside. Beachgoers are perplexed on which seaside paradise to visit first. Meanwhile, food connoisseurs can’t decide on the immense variety of cuisines at their fingertips. In Mogan, travelers have something to look forward to every single day, everywhere. Even in the pre-historic times, the splendid climate and natural riches have attracted people to the island. In fact, various archaeological sites in the Valey of Mogan have been unearthed proving that the area was inhabited for thousands of years. Fast forward to roughly 200 years ago, the abundant aquatic resources also brought fishers to its sandy shores, and they came to settle in what we now call Playa de Mogan. Unquestionably, Gran Canaria has always been inviting, even in the olden days. In the 1960s, the artist and developer Rafael Neville dreamed of transforming a then simple fishing village into a world-class seaside resort, the most beautiful in the island. It took many years, but by 1983, the project finally began. In 1988, Neville’s brainchild was completed, and it was magnificent. 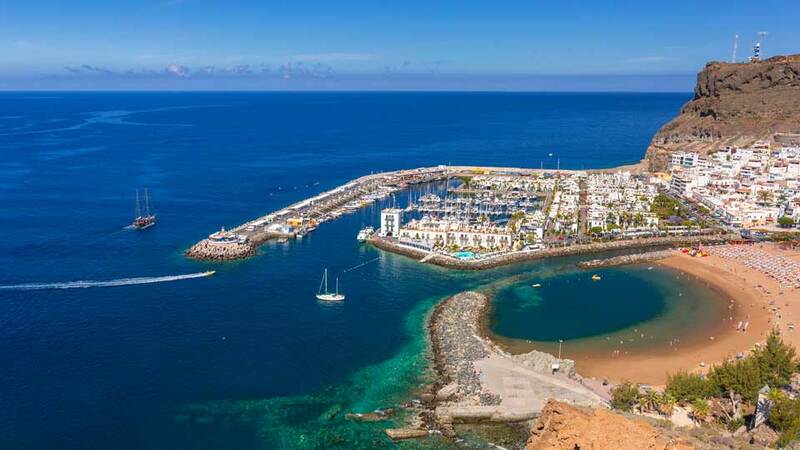 The new Puerto de Mogan was so stunning that it earned the moniker “Venice of the Canaries.” Since then, it became one of the finest and most visited tourist destinations in the Canary Islands. Mogan has always been a fascinating town, but recent additions, like the artificial Playa de Amadores, has made it even more marvelous. Its highlands shaped by time, coasts carefully crafted by Mother Nature, and human-made marvels built with strong hands. Like a fine wine, this exquisite beauty gets better with age. This amazing town is home to the most sublime beaches in Gran Canaria. There are beaches with golden, white, or even volcanic gray sand. One would think that with such a variety of coastal charmers to choose from, it must be hard to decide which to visit and where to stay. But that is not the case with Mogan, as its beaches and resorts are usually close together. Vacationers may stay on Playa de Amadores and walk to Puerto Rico on the left and Playa del Tauro on the right, or stay in Patalavaca and jog to Anfi in the morning. They also have various fun activities for all ages. The fishing village of Arguineguin has recently grown into a popular tourist destination. The views of its port where boats of different colors and sizes dock add to its small coastal town charm, while the lovely sight of the buildings and houses at the fore of the magnificent mountain is utterly astonishing. Tourists and locals alike also love dining in the restaurants by the harbor or flock the street market every Tuesday. The famous port of Gran Canaria, Puerto de Mogan is a picturesque fishing village and one of the most extraordinary resorts on the island. It is so stunning that it’s called “Little Venice” or “Venice of the Canaries” by admiring tourists. The golden sand beach, Mediterranean villas on the hills, an array of restaurants and bars by the boardwalk, and the lovely view of the bay full of expensive yachts and quaint boats never fail to mesmerize travelers. Known for its grand playas, the marvelous stretch of mountains is just as spectacular. Watch the clouds move above its rugged massif, walk past lush groves of endemic spurges, or climb up a summit to see the glorious co-existence of land and sea, all while basking in the Gran Canaria sun. Travelers have not truly explored Mogan until they discover the gems hidden in its countryside. Switch from flip flops to hiking boots, and get ready to be amazed. 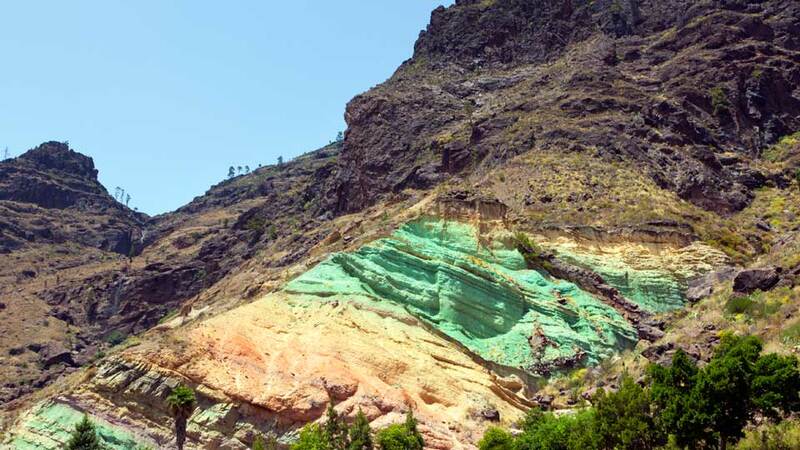 Tourists who want to see something unique will surely be fascinated by the large the multicolored rock formation of Los Azulejos at the foot of El Barranco de Veneguera. For leisure walkers, visit the Natural Park of Ojeda and see the pine forest of Inagua y Pajonales. There are enchanting walkways in the ravines of Toscas, Puerto Rico, Tauro, and Taurito as well. To get to know the culture of the locals, travelers must walk in the streets of Mogan and visit the church of Saint Anthony, built in 1814. Be in awe of its ornate wood carvings and beautiful statues of Saint Anthony of Padua and the Immaculate Conception. Every 13th of June, they may also partake in the two-week feast to honor San Antonio El Chico (Little Saint Anthony) together with the residents. The celebration includes a folk festival, cultural displays, and ends with a procession of the patron saint through the streets of Mogan and the traditional Canto de Los Pajaritos. Every July, another important celebration happens in Mogan, Arguineguín and Puerto de Mogan. Tourists will enjoy the maritime procession of “Fiesta del Carmen” where locals take the statue of the Virgin Mary from one coastline to the other with a myriad of decked out boats. If there’s a fiesta for the San Antonio El Chico (Little Saint Anthony), of course, there’s also one for San Antonio El Grande (Big Saint Anthony). Every first Sunday of August, the locals honor a mutual promise to beautify the saint and get a new procession throne to release them from the locust plague curse that ravaged the town’s crops. They say shopping is cheaper than therapy, and in Mogan, shopping is better than everywhere else. There’s a schedule though, so tourists must plan. On Tuesdays, everybody heads to the street market in Arguineguín for fruits, vegetables, cheap clothing, and other great finds. While on Fridays, Puerto de Mogan rises before daylight to host the crowded market until two o’clock in the afternoon. Throngs of travelers and locals alike march to these markets in search of bargains and good buys, their haggling skills getting better every time. 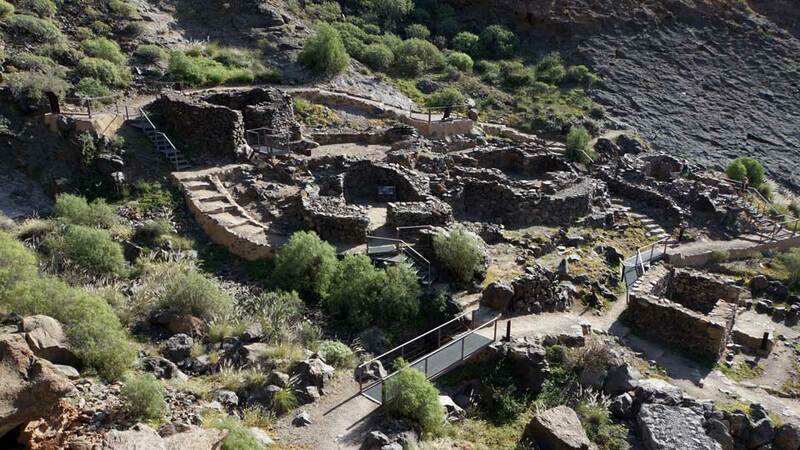 The Canary Islands have a rich pre-Hispanic culture that it is evident in their many archaeological sites. Mogan also houses a good number of these ancient relics that tourists can explore. The most famous of which is the 1,300-year-old coastal site Cañada de Los Gatos. This ancient settlement is in an excellent strategic location for the early inhabitants of the island, as it offered them water from the ravines, suitable soil and climate for farming, and abundant aquatic resources. There are also other interesting ancient sites in the municipality that tourists can visit, like the Castillete de Tabaibales and Majada Alta. The prior sits on a mountain top and is known for its unique watch towers and defensive walls. The latter is a small cave with human-like symbols painted in red ochre, which puzzles archaeologists up to this day. Complementing the beautiful beaches and landscape in Mogan are the equally spectacular accommodations. Regardless where travelers wish to stay, there’s a perfect place that can answer their every need. There are illustrious hotels by the cliffs that offer a full view of the breathtaking sea, chic ones in busy streets where tourists can party and mingle with the locals, or even luxurious apartments near golf courses. In this town, tourists get their perfect vacation even in slumber. Guests praise this 5-star hotel in the lovely Puerto de Mogan for its spacious rooms with large balcony, great food, and very accommodating staff. Just a 6-minute walk away from the beach, this superstar features two outdoor swimming pools with a hot tub, as well as one pool for children. It also has an on-site fitness center, a spa with an indoor pool, a hot tub, sauna and a Turkish bath. The stunning hotel is for anyone who wants to travel with comfort, style, and luxury. This budget 4-star hotel in Playa de Mogan is perfect for couples and families with small children. The large compound of Canarian architecture with tropical gardens is a short 7-minute walk from the beach. It also features rooms with balconies, two outdoor swimming pools, spa, hot tub, sauna, and two restaurants. Experience the Canarian hospitality and enjoy magnificent views in one hotel. All Cala Blanca apartments have large terraces with an amazing view of Playa Taurito and its fantastic black volcanic sand. The complex is also just a 4-minute walk away from the beach and features an outdoor swimming pool, restaurant, tennis court, fitness center, sauna, 24-hour reception, pool table, library, as well as a mini market. Please note however that hotel is not recommended for guests with walking disabilities as it is in a mountainous area. Although there are steps, it is not accessible by wheelchair. This club in Arguineguin is favored for their large apartments with balconies and views of the spectacular ocean, golf course, and the pools. If those are not enough, each apartment also has fully equipped kitchen and comfortable lounge area. Guests of all ages will also enjoy the many on-site activities available, such as mini golf and water polo for kids aged 4-10, canoeing and archery for ages 11-15, and paddle tennis, squash, giant chess board and shuffle board for adults just to name a few. This splendid property is just a minute walk away from Playa del Cura and has a fabulous rooftop swimming pool where guests can lounge while admiring the breathtaking views of the Atlantic. They offer large rooms with private balconies and junior suites with a separate bedroom. This resort is recommended for golfers as the Anfi Tauro Golf Resort is just a 5-minute drive away. Everyone loves food, and for Foodie Globetrotters, a gastronomic experience is just as important as the sights to see. Travelers fly around the globe, cross seas, or even walk miles to visit places, but they rarely find that one special place they’d keep coming back to. In Mogan, they know that taking care of their tourists will make them come back for more. So, they offer the most stunning places and make sure to satisfy their tummies. With a growing number of tourists each year, needless to say, it has been effective. This fabulous fine dining restaurant located in Puerto de Mogan never disappoints. From their great tasting menu to the excellent service, guests are in for an unforgettable dining experience. Que Tal By Stena Restaurant only serves an 8-course menu, and they are not cheap. But everything coming out of their kitchen is an absolute work of art on a plate. Enjoy European and other international cuisines from one of the most famous restaurants in Gran Canaria. The VIP Pizza Restaurant no doubt makes the best pizza in Mogan. This restaurant in Playa de Amadores is always full. As such, it is best to call for a reservation before heading there. Should there be no available seats, they can also do take away. Aside from their famous pizza, diners also rave about their garlic bread, bruschetta, and profiteroles. This famous restaurant right on Playa de Amadores is where people can enjoy a fantastic meal with amazing views and cool music. Their delectable menu offers a good variety of choices, from ribs to tapas, and even pork shawarmas. Although all the dishes are tempting, one must never leave without tasting any of their divine burgers. Arguably the best restaurant in Puerto de Mogan, N’Enoteca Restaurant has diners raving mostly about their Italian dishes. Most of the guests claim that the pasta carbonara is the best they have ever tasted. The other highly recommended dishes on their menu are octopus and camembert, mortadella, beef brisket, asparagus pasta and melanzane just to name a few. They also serve Mediterranean and other European dishes. What is a beach vacation without ice cream? Yes, incomplete. Exactly. Although there are many ice cream parlors by the beachfront, Gelatomania Restaurant is the best. Best known for ice creams, they also have to-die-for flat bread, smoothies, waffles, and coffee too. Tourists can rent a car, hire a cab, or take public transport from the capital Las Palmas to Mogan. If they decide to go with the last option, they are in luck because Gran Canaria has a great public transport system. For travelers who’d like to see a lot of the beautiful south, Global Bus line no. 1 from Las Palmas stop at every town till they reach their destination. For those who prefer to arrive at the resorts as quickly as possible, Global Bus line 91 is their ride. 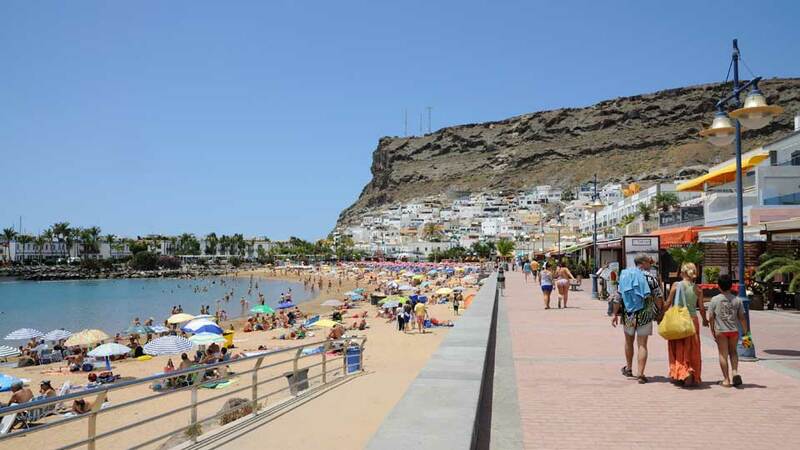 It takes around an hour-and-a-half drive from Las Palmas to the city center of Mogan. Line 91 departs hourly and stops at Arguineguin, Puerto Rico, and finally, Playa del Cura. Tourists just keep coming back for more, and every return tends to be longer than the last. Simply, there’s not enough time to do everything in one visit. And just a few visits don’t seem to suffice. In Mogan, there are many spectacular things to see, fun activities to do, and endless great food to try. It’s no surprise many travelers go back at least once a year. Some stay for a few weeks while others choose to remain for good. Simply put, once is never enough for a town like Mogan.